I love sitting down at a table with people and sharing a meal. Whether it’s a holiday meal with the family that has loved me my entire life, or an evening out with new friends, I always enjoy “breaking bread” with people. “Breaking bread” has a special meaning in Christianity. If you are (or ever have been) a church person, it probably draws your mind to images of Communion (or Eucharist or The Lord’s Supper, depending on your tradition). 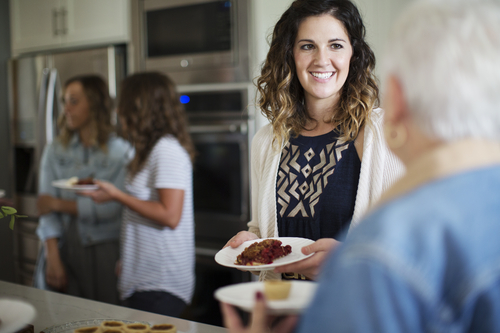 Churches handle Communion in diverse ways. Some churches offer it weekly, or monthly, or quarterly. Some churches, like mine, offer an open table—anyone who wants to receive Communion can. Other churches ask that you check with the pastor or priest beforehand. Sometimes Communion is the focal point of the service and there is a lot of formality and fanfare, while other times it’s an almost private moment at the end of the service. Personally, I’ve been drawn to different methods in different seasons of my life. Currently, I favor the more personal and intimate approach. We don’t always think of Communion as a meal, maybe because it’s just a piece of bread or wafer and a splash of juice or wine, but it is a meal—the kind that nourishes us spiritually and physically. Sharing a meal was an integral part of Jesus’ ministry. In fact, it is one way he revealed himself to people, and it is one way he continues to do so today. Church folks know this part of scripture because it’s usually recited in some form as part of the Communion ceremony. What we may not always remember is that the shared meal was important to Jesus after resurrection as well. Jesus offered them peace, but they were too gobsmacked to let his peace settle on them. They were “startled,” “terrified,” “frightened,” and “doubts arose in their hearts.” (Luke 24:37-39) Jesus didn’t retreat. Instead, he offered them more of himself. He invited them to touch his hands and his feet. The disciples were simultaneously filled with joy and disbelief—it was a too-good-to-be-true moment. Later, Jesus was represented in art by the ICTHUS, a fish. ICTHUS meant fish, but it was also an acronym for “Jesus Christ, Son of God, Savior.” It also reminds us of this post-resurrection meal (and the fact that many of the disciples were fishermen, and that Jesus fed 5000 with loaves and fishes, and … well, you get the idea). 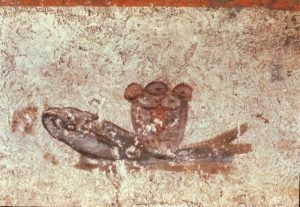 In the catacombs of Rome, you can see art like this where Communion includes a fish, symbolic of Jesus. Communion is, for me, more than an act of remembrance. John Wesley called it a means of grace—it opens my heart and allows me to see Jesus in new ways. Like the disciples on the road to Emmaus, I need Jesus to be revealed to me. Like the disciples in Jerusalem who were startled, terrified, frightened, and doubt-filled, I need to share a meal of Jesus, and with Jesus, in order for God’s peace to settle on me. Let us break bread together, my friends. What about you? Do you look forward to Communion, or do you feel disconnected from it? How often does your church offer Communion and how is it shared? Tell me about it in the comments, in an email, or on Facebook.